I am reading America: 3 books from each state in the US with the following authorships represented – women, men, and non-Caucasian writers. To follow along, click on the Andrea Reads America tab on the left. For more resources on reading geographically, please see Resources for taking a literary tour of the US. ¹ No, I do not plan to read every book listed here. Are you crazy? ² If I am wrong on any of these, please correct me. In cases where I haven’t read the book (i.e. most of them. 88% in fact. ), I cannot be sure how much of the narrative takes place in a particular setting. Also, the stars on the maps do not indicate specific cities or setting within a state, only that the book is set in the state. I’d be here forever if I scaled down to city level, and I’ve got reading to do. ³ The spread is fascinating, isn’t it? What’s up, Western States? 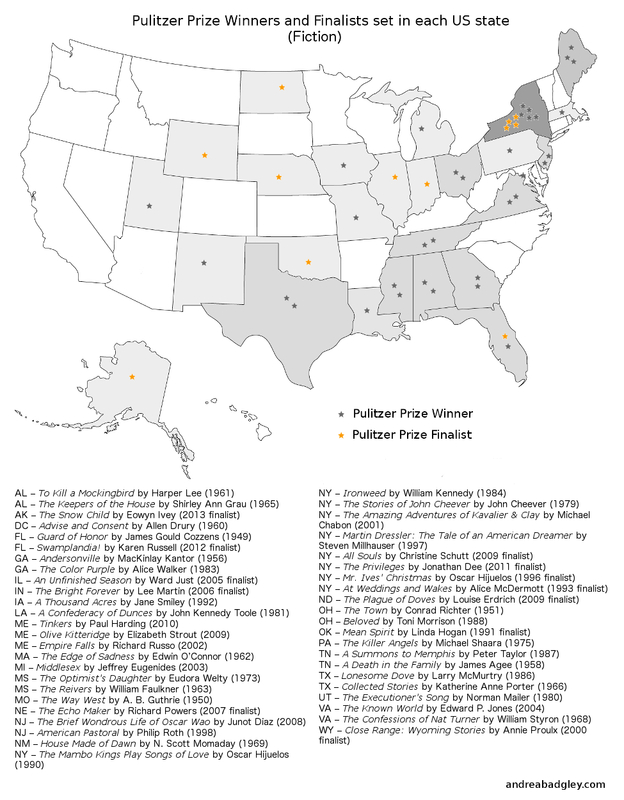 Also, look how many Pulitzer winners are set in New York: NINE if you include finalists. The committee was hooked on Maine for a while there, too. 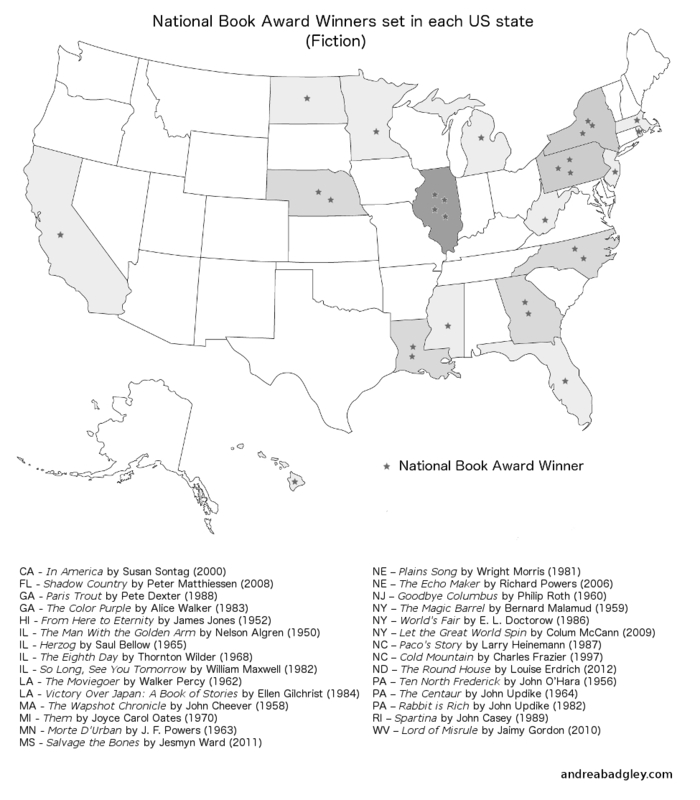 And the state with the most National Book Awards? Illinois. What does it all mean, people?! ⁴ My personal familiarity with the books came into play here. Though the story travels from Texas to Montana, I included Larry McMurtry’s Lonesome Dove for Texas, mainly because the point of view is clearly Texan, and because McMurtry evokes Texas so beautifully that the state becomes a character in the story. I wonder if John Steinbeck’s The Grapes of Wrath works similarly for Oklahoma, as it is told from the Okie perspective as Oklahomans journey west to California. I do not remember the book well enough to feel comfortable plotting it in either Oklahoma or California. If you have strong feelings on this, please let me know in the comments. If you’ve read any of these and have opinions on them, please let me know. I’ve read a few and thought Bah, what’s the big deal? while others have blown me away. I’m curious what your thoughts are. Thanks! Such a great idea. It must have taken soooo much research! I’ve been working on it for a few weeks – now I wish I had done the Nobel winners as well. One day! We simply MUST take a day trip to Charlottesville where the marvelous “Old Dominion” bookstore on the mall has Pulitzer, Orange, and Nobel prizewinners in a special section. Take any book of that shelf and I guarantee happy reading. Plus the store itself is a reader’s delight: crammed full. And then there’s Mudhouse Coffeehouse: best. mocha. ever. Whatcha doing this weekend?! That sounds dreamy!!! We have a swim meet all weekend, but soon, Les, soon we should do this. You should do this during VA Festival of the Book next week in Charlottesville. All kinds of good readings and discussions. When I got to Bucknell in the 70s, learned he had been there twenty years before. And, we had the same advisor (who is still in Lewisburg and getting ready to celebrate his 90th this summer). So, that’s my distended personal connection. More than that, however, Roth is worth reading in part because he’s written a lot. He is a testament to writing every day. Just working the craft. His ‘neighborhood’ is New Jersey where he grew up in the 40s and 50s. But he, and his characters, grow beyond the confines of Newark and surrounding communities. I liked ‘Patrimony’ because it was an unblinking look at the aging and passing of a parent. I liked ‘The Plot Against America’ because it was a plausible look at the 1940 presidential election when much of the country opposed getting involved in another European war. I don’t have much to say about ‘Portnoy’s Complaint’ or ‘The Breast’ except they titillated at the time. But Roth has established himself as a major American writer. He would be worth your investment of time. A friend recommended Martin Dressler (Pulitzer list, NY) shortly after it came out, and I found it mesmerizing. If it’s not on your to-read list now, do at least note it for future consideration! John Updike has been someone I’ve been curious about for a long time, and I recently got the first Rabbit book, although I still haven’t read it. One of these days. On Philip Roth: I haven’t read a ton of his work, but as a Classicist I have to recommend ‘Human Stain’ – it’s a great study on identity and race in America. As always, I enjoy your reflections on this adventure, thanks for sharing. New York is going to be impossible. I have no idea how I’m going to narrow it down. I love the subtitle for Martin Dressler: “The Tale of an American Dreamer.” Who wouldn’t want to read that? I heard an Updike story on the New Yorker fiction podcast the other day, and I’m curious to read more of his work. It reminded me of a Norman Rockwell painting, but where you can hear what all those perfect happy Americans are saying, and it’s not always what it looks like from the outside. And boy, it sounds like picking a single Philip Roth is going to be as hard a choice as making my New York selections. It’s a good thing I’ve got a while to decide. Thanks so much for your insight. Here’s a few I’ve read that I wonder why they are on it. They are mediocre or just a nice read at best. The Snow Child, Swamplandia, Olive Kitteridge, The Known World, Salvage the Bones, The Round House and Middlesex. I think some make it for their controversial topics others for their multiculturalism. I don’t think they make it for their writing merits. Great books for history freaks who like a good story sometimes and not just the facts. Andersonville, The Killer Angels and Cold Mountain. Andersonville has been criticized for it’s writing style but I like it. When you read it, you feel the dirt, disease, starvation and desperation of the the camp. You feel the true evil of war. The Killer Angels takes you to the battle field and into the Generals and soldiers minds. It gives you Gettysburg. Cold Mountain is another look entirely at the Civil War. It is about getting home, finding safety, reuniting and the possibility that will never happen. Books that everyone should read, Ironweed and The Color Purple. Oprah didn’t write the book and don’t watch the movie. Read the book. Fantastic book, A Confederacy of Dunces. You just have to read it. Sarcastic, humorous, dark. bizarre. For those with an open mind. It is a shame John Kennedy Toole took his life and only gave us this one masterpiece. The Grapes of Wrath, one of my favorites can’t make these lists. It predates them as it was published in the mid 1930’s. Missing, John Irving, Cider House Rules is a masterpiece. I have Empire Falls and The Brief Wondrous Life of Oscar Wao on my to read list, but few others really catch my eye that I haven’t already read. Thanks so much for your recommendations. I didn’t click with several of the winners I’ve read (Tinkers, Olive Kitteridge, couldn’t get into Empire Falls and put it down), but I’m looking forward to trying out others. I read A Confederacy of Dunces a long time ago and it didn’t do much for me, and I’m curious to revisit it now that I know more about it (and life in general). I haven’t read Ironweed and have been curious about The Killer Angels since reading the blurb in my research. I appreciate your insight here – thank you! I read The Killer Angels when it first came out and it didn’t do anything for me, and I consider myself a Civil War buff. Also, I don’t know if it will say anything about Pa. to you, but, perhaps that’s not your goal anyway. It will have you dreaming for years. Yes, fascinating! Great work! I haven’t read many of these books, but I loved Cold Mountain, thought it was GORGEOUS. I tried reading Lonesome Dove because I adore the mini series but couldn’t get into it. Definitely plan to try again one of these days. Interesting to see that Joyce Carol Oates won a National Book Award; I’m a fan and had never heard of THEM. Will have to check it out. Thanks!